If you are planning to move house or to new business premises, our range of Removals products are more than up for the task and include Removal Boxes, Protective Packaging, Packaging Tape, Strapping, Tape Dispensers, Printed Tape, Cutters, Scissors and Industrial Markers to have you prepared for moving day. Keep your items safely stored with our Removal Boxes and our selection of Protective Packaging means you will never have to worry about anything being damaged when moving. We also supply a variety of Packaging Tape, Printed Tape and Tapes Dispensers to seal up your storage and house removal boxes effectively and Strapping when transporting heavier items from place to place. With Free Next Working Day Delivery available too, you can place your trust in the Post Office Shop to supply the best in Removals products at the best of prices! 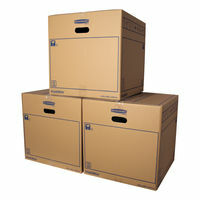 See all items Ensure a safe and simple move with our wide selection of removal boxes and cartons. See all items Protect fragile items when on the move with our full range of protective packaging. See all items Safely seal boxes with our selection of heavy duty tape dispensers and tape guns. See all items Get your message across when packing boxes and parcels with printed tape. See all items Make moving house or business less stressful with our range of cutters and scissors. See all items Mark up important details on a variety of surfaces with our range of industrial markers.